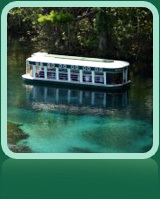 Sparkling clear water--glass bottom boats--marvelous animals--Florida’s natural wonder, Silver Springs Nature Park, is a short drive of 11 miles from the Holiday Inn & Suites - Ocala Conference Center. Click here for interactive directions to Silver Springs Nature Park powered by Google! The largest artesian spring formation in the world, known as Silver Springs, pumps out 550 million gallons of crystal clear water a day and is surrounded by a 350 acre nature theme park. Silver Springs Nature Park is a popular venue for movies, televisions shows and commercials. "Tarzan", "Sea Hunt", "Creature from the Black Lagoon", "Smokey & the Bandit 3" and "I Spy" are just a few of the great shows made in and around the springs. Famous glass-bottom boats allow thrilling views of fish, shellfish, turtles and alligators in their natural environment at depths up to 80 feet. Explore nature’s beautiful grounds surrounding the springs, home to Florida’s largest alligators, endangered bears and panthers. Silver Springs Park also features the Kritter Koral petting zoo, a variety of wildlife shows and rides and exhibits for all ages. The Park is host to several special events and concerts throughout the year with the annual Festival of Lights being the biggest. Festival of Lights features more than a million twinkle lights, neon displays, local choirs, strolling carolers, lighted boat parade and more to celebrate the Christmas season. Visit the official website linked below for complete information including operating hours and a calendar of special events.